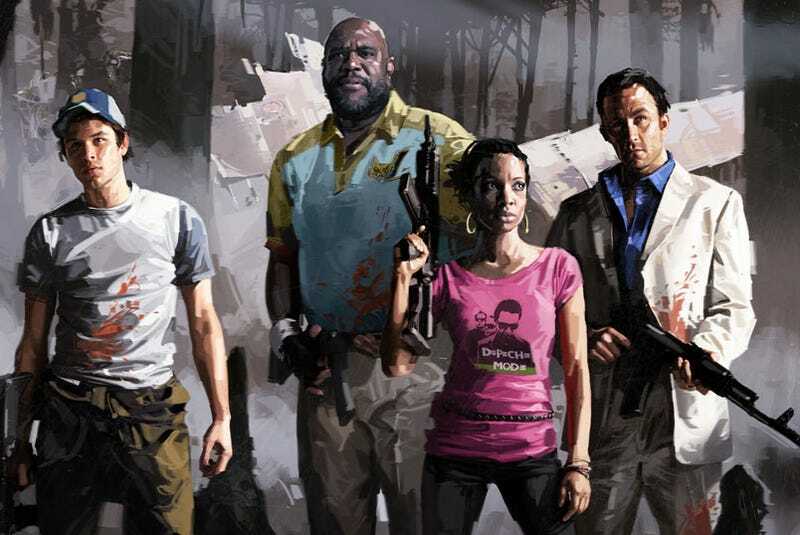 The zombie apocalypse isn't where one expects to find product placement, so it was a little surprising to see Rochelle, one of the new Survivors in Left 4 Dead 2, sporting a pink Depeche Mode t-shirt. Surely, I thought, when first seeing the band's likeness and logo emblazoned on her tee, that wouldn't last very long. But that Depeche Mode cameo is intentional and it's authorized. Chet Faliszek, co-lead and writer on Left 4 Dead 2, says that Valve solicited bands and record labels for the sequel, but Depeche Mode was one of the few who responded. And it appears they responded in a big way, with Faliszek explaining to us at Comic-Con that the band was very free with letting Valve use its likeness, its audio recordings, and, obviously, its t-shirts in the game. Probably a smart marketing move, considering the band just launched an album and constantly reminding a few million Left 4 Dead players of the band's existence can't hurt. Faliszek didn't expand on how, or even if, Depeche Mode would be employed beyond the outfit of the "cool 80s chick," but we're hoping for a well-hidden cameo. We'll definitely be on the look out for any zombies that even slightly resemble Dave Gahan, just in case.